Our seats for the race were at the top of the final down-hill stretch to the finish line on Broad street, comfortably in the shade on the sidewalk a few paces from where Craig and Alistair warmed up. Looking to our right was the view down Broad street to the start/finish. This picture is of Craig's race (Men's Masters 1/2/3) a moment before the start. The race is 30 laps or one hour, whichever comes first. The judges time the pace to estimate the number of laps to the finish. They announce five laps to go so the racers can judge their final sprints. About a third way through the race I began my walk around the circuit taking pictures of Craig as he passed by. In order to set up and take the pictures (digital cameras are notoriously slow to digest each picture) I could take only one picture per lap, so each picture is at a different point in the course. This is nice because you get some feel for the course ambiance as the bikers struggled up the back hills. You also get a feel for the difficulty of the course as you huff and puff up the 400-foot elevation change of the 1.1-mile circuit. I show three of the six pictures I took. 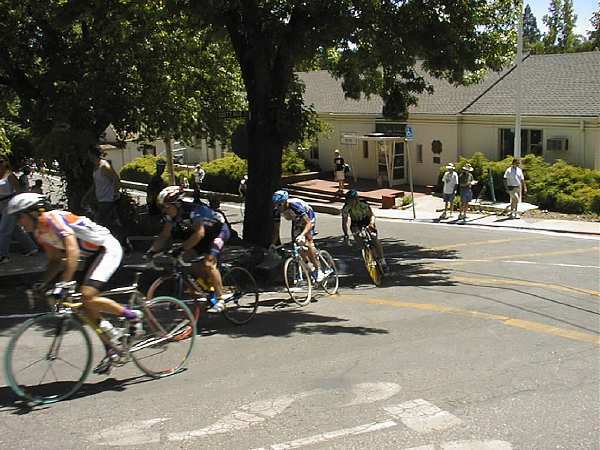 Here's Craig (green jersey) in the fourth position of first chase group. blurred images that they're moving at a good clip even up the hill. 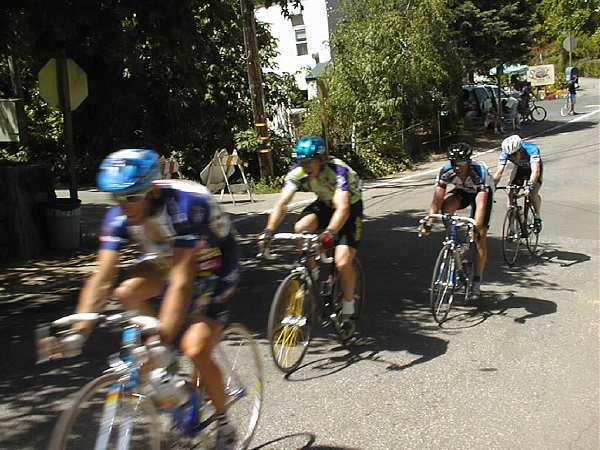 "... and Craig Lindberg of Alto Velo is in fifth making his move for fourth!" 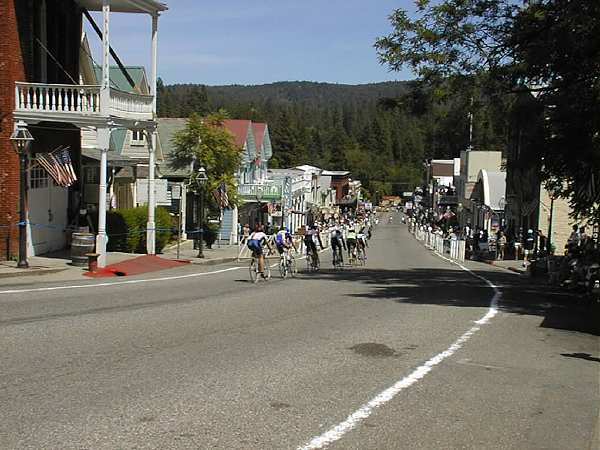 ...I'm chasing fourth place of the 39th Annual Nevada City Classic (M35+ 1/2/3 ) in a 4-man group. The crowd is cheering and I hear "Craig Lindberg of Alto Velo" announced over the PA several times. There's a motorcycle with cameraman for OLN (Outdoor Life Network) buzzing by from time-to-time to keep track of our progress. But halfway up the staircase climb on the FINAL DARN LAP my front tube explodes like a grenade. GAME OVER. 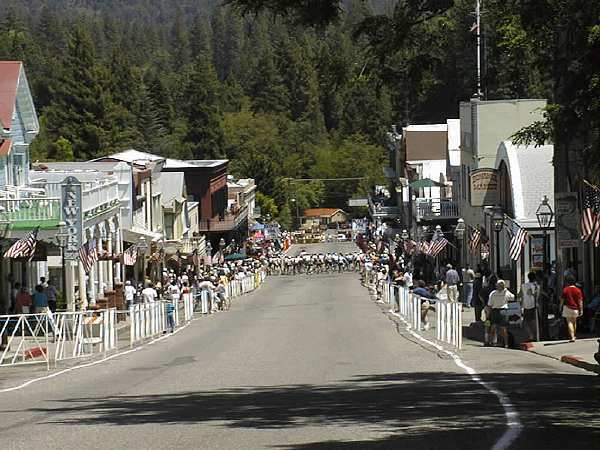 Do I -- (1) pack it in, (2) look for the wheel pit up the road and lose 10+ places, or (3) slog out 3/4 mile of steep, bumpy, twisting hills with 40mph descent into a hairpin riding a rim wrapped in disintegrating, fold-up clincher? Remember now, my brain is spaghetti as I've been going flat out for the better part of an hour. I've trained months and tapered down for this day. 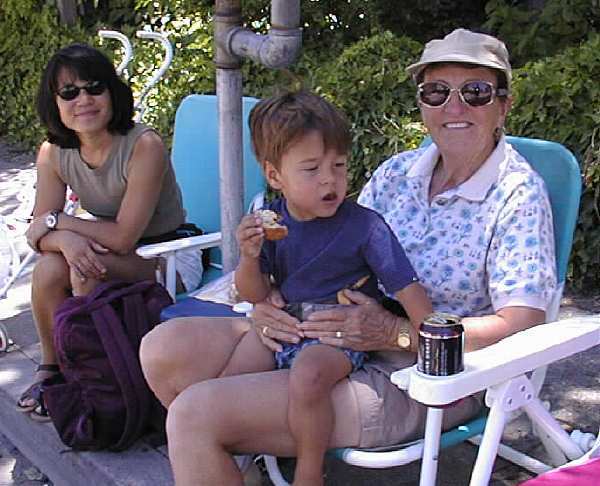 My parents are watching. My wife is watching. My 2-year-old son is watching (well, actually playing with someone's dog on the sidewalk). There was no choice. I had to ride it. My front wheel felt like slogging through snow with every corner hiding invisible ice, but the beastly thing never got away from me. Training the dirt fire roads above Los Gatos on a road bike doesn't seem quite so stupid anymore. But, Oh! My brand new Spinergy Spox wheel! Argh!!!! I tried to power fast and hard enough to keep my break-mates in sight which was pretty much impossible. The uphill turns were devilish, but the downhill turns were hair-raising. Looking over my shoulder at 40mph into the finish to determine if sprinting was necessary is among the stupidest things I've ever done in my life. But then I tried to stop. Oops. I started to auger into the steel crowd fencing. Some lady screamed as I just about biffed over the post she was leaning on. But I held it upright. Ta-daa! Two point landing! Not a scratch. Phew. the racing gear booths after the race. Teammate Alistair was looking real good and we were both in the chase group at 4th place until Alistair dropped a chain which then tied itself into a knot around his crank arm. He changed bikes on the start/finish and crept back in for a miraculous 10th. Disappointing after 3rd last year, but another "never-say-die" effort. 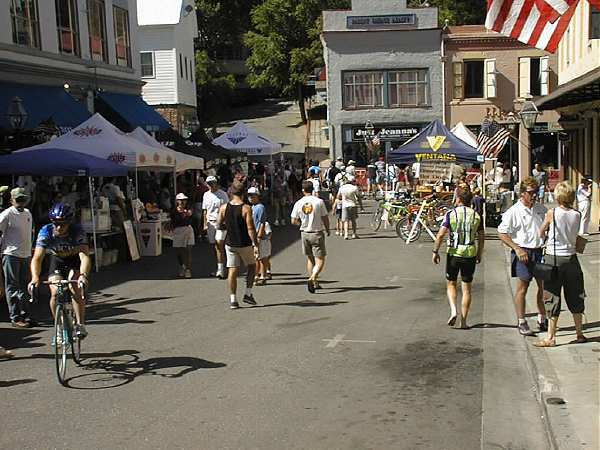 Glen Winkle of the US Postal Service (the Masters Category of Lance Armstrong's team) won it yet again with Brian McGuire in 2nd and Kevin Metcalfe (also US Postal) in for 3rd. Kevin Metcalfe was in our chase group the last 6 laps. 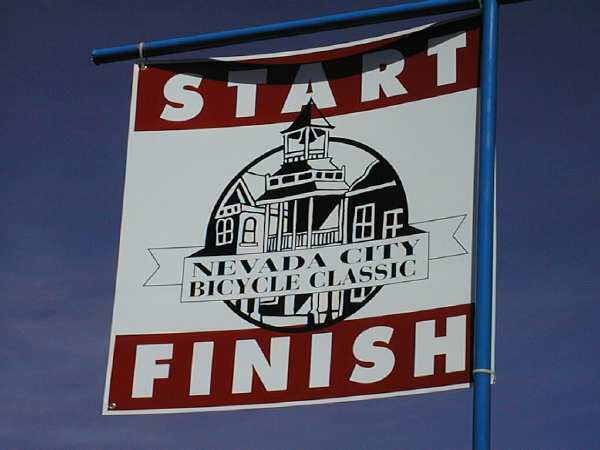 The complete tally from all the races is posted at: http://www.galeforce.org/nevada99/nevada_99_results.htm .